Canadian SDA members: We have exciting news! The John M Parrott Art Gallery in Belleville, Ontario has agreed to accept the Edge of the Forest for a six week exhibition June, 2015 - mid July, 2015. 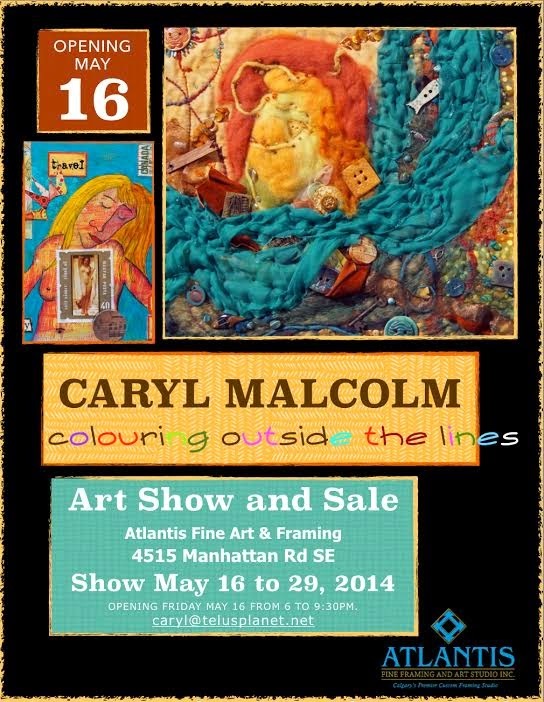 Caryl says, "This is my first art show and sale. It is a mixture of pieces that I have been working on this past year including mixed media on fabric, paper and board; acrylic on canvas and paper, with a whole range of exploration and discovery." http://thistle-threads.blogspot.ca/ Historical perspectives, the making of period needlework, and interesting tidbits about how, why and where certain threads are made, or why they have gone "out of style"
http://makeitindesign.com/blog/ The Art and Business of Surface Pattern design---more a commercial site for textile designs on conventional substrates (cloth), but a visual feast nonetheless! and http://karmadecay.com/faq . There is also "src-img" which is added to your Mozilla bar. And please--if you are using popular "sharing" sites, ASK permission first of the image holder and maker!!! Karin used to live in The Sultanate of Oman and believes the only thing better than living in Oman would be to go there and study art. Here is a chance to do just that. If you want more information get in touch directly. Greetings from Bait Al Zubair! Bait Al Dalaleel’s Art History summer course at Bait Al Zubair is an excellent introduction to the study of contemporary art. It sustains and develops students’ abilities and interests over a four-week period and offers an outstanding opportunity for an intensive engagement with Fine Art practice in a historical and practical sense. The course encourages individual creativity whilst imparting a solid grounding in the practical and the aesthetic. During the course we will be looking at both historical and contemporary art through a range of lectures, discussion-lead seminars and practical workshops. This will provide grounding in the history and theory of art which contributes to students' overall development as artists and their awareness of the relevance of these critical studies to the contemporary practicing artist. Please find the Introduction to the course attached as well as the application package with all the details. Limited space is available. Deadline for application is the 15th of May 2014. And don't forget our May meeting on the 21st!!!!!!!!!!!!! !